It is midday on Carnival Monday and I am only just walking home from the best J’Ouvert ever. Hoping if I stayed out to wring all the possible enjoyment out of the morning. In the stark light of noon I imagine I look like a misplaced jumbie who has lost her way back to the other realm where no one minds if your face is a mosaic of mud and purple blue green. I am at my freakish best, but it’s Carnival and the road is for everyone now. I do not combust under the stares of the pretty mas girls who jiggle past me, their beads making shh shh noises. The mud and paint make a pasty moustache with the obscenely expensive coconut water. But I don’t mind. Because I have just had the best J’Ouvert ever and nothing else matters as I try to savour every memory of the hours before dawn.Walking into the sunrise and feeling that electric connection to everything and everyone. You forget fear and your uncrunched abdominal muscles. There is no separation between sacred and profane. Everything is everything. A wine is still a wine and between your friends and the strangers and the tourists and the vagrants you find your humanity. You too drag in the canal. You climb walls and find your balance. You jump and spin and catch an old familiar power. You shout into the coming dawn. Look mih! You have no mirror to see your state. You imagine you look like the people around you. Absolutely stink. You fall in love with Trinidad and yourself again. It is perfect in its grossness. Like birth. Magical and horrible at the same time. Essential and unavoidable. It is midday on Carnival Monday and I am thinking already about how long I have to wait to be in this place of bliss again. And I wish I could do it all over again on Tuesday morning, but this is not to be so. 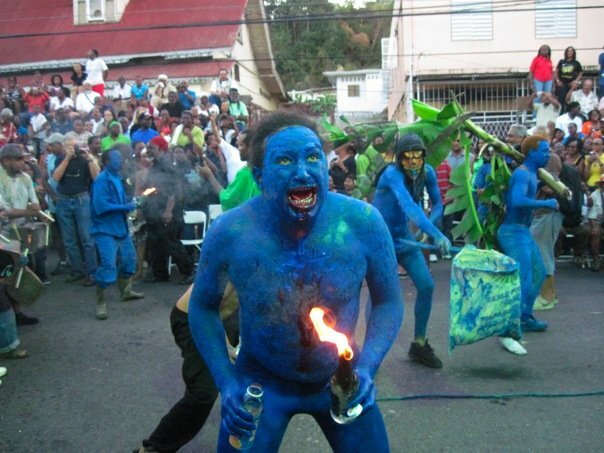 More than one J’Ouvert might send the country more mad. I walk through the Savannah. Listening to Carnival living around me. Past tired. Past happiness and misery, in a J’Ouvert state of mind. I am still thinking about Monday morning on Tuesday, on the streets, playing a protest mas. We are playing contemporary cow mas, walking on familiar roads with new swagger. My placard says there is too much at steak. We are enough to distract spectators and revellers from the endless waves of feathers, beads, silicone, high-heeled boots. We are enough to make people smile and want to take pictures with our absurd placards. We are going for the title of Best Unregistered Band because Carnival brings out our competitive spirit. We moo and stampede at will. There is no rope around us and we make our own music. We are liking ourselves in our little band. Because I guess we all end up playing ourselves at Carnival. A bigger, brighter version of ourselves. How we imagine we would be if we had the vision and the fortitude. It is the time when we actually manage to walk our talk. Walking across the Savannah on Tuesday night, past the traffic and the sound of Carnival dying all around, I am thankful for the opportunity to walk my talk. To take this idea of myself a little further. At midnight the silence comes, covering the Belmont Community Centre where Rasta bredrin and sistren begin to skank on tiptoe. No more frenzied feting sounds. No more pan sounds. No more late night speeding up the avenue hoping that no-one followed you home sounds. The Carnival is over and now the sleep that I was avoiding, does not want to come. So I lie in bed and I listen to the 3 am nothingness. Wondering how to walk my talk without having to wait another 365 days.